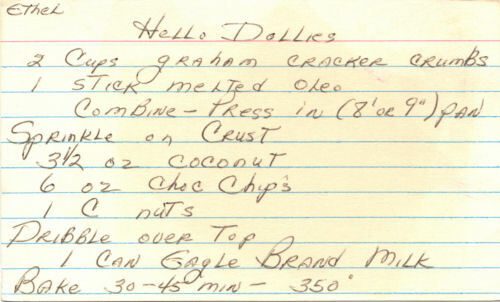 This recipe was written on a lined index card and found in a large collection, date unknown. It’s marked “X Good” in the top right corner so it must be! I’ve typed it below along with a scanned copy (front side only). 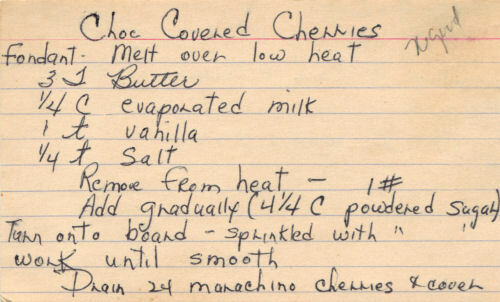 Drain 24 maraschino cherries & cover with fondant. Heat choc. chip until melts. Drop into choc & remove with 2 forks. 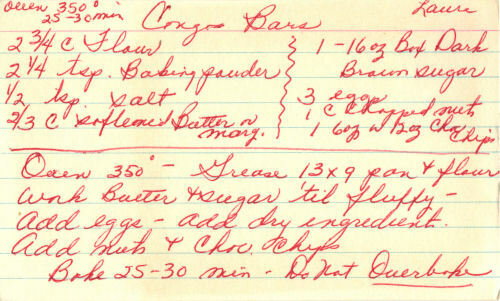 2/3 c softened butter or marg. Work butter & sugar ’til fluffy. Add eggs – add dry ingredients. Bake 25-30 min. Do not overbake. 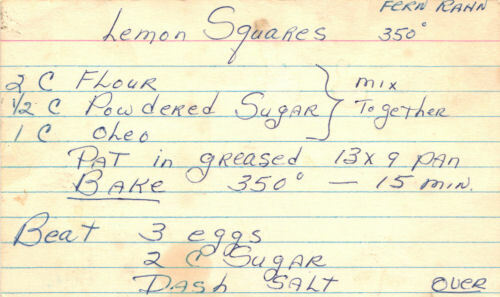 Pat in greased 13×9 pan. Bake 350° – 15 min. Run knife around edge while warm after baking. Sift flour, baking powder & salt. 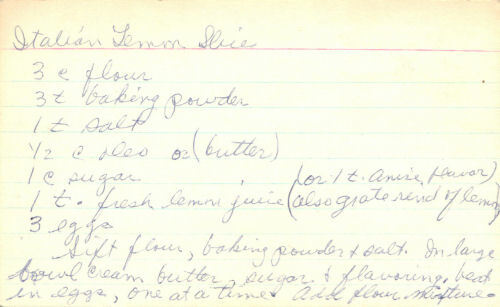 In large bowl cream butter, sugar & flavoring, beat in eggs, one at a time. Add flour mixture. Mix well, turn out onto flour table and knead for a few minutes, add flour a little at a time so it won’t be sticky. Divide into three or four balls. Roll each ball into a 1″ diameter. Place on greased sheet. Bake 350° 25 min. Sprinkle top with colored sugar & press down slightly before baking. Slice about 1/2″ slices while still warm. Spread on paper towel to cool. Store in baggies or plasticware. 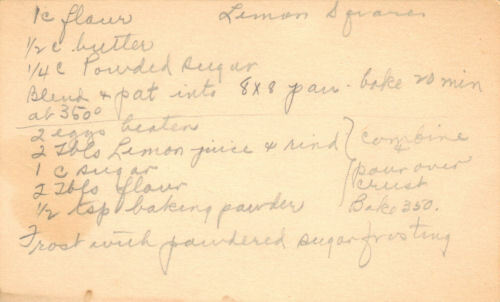 This recipe was written on an index card and found in a large collection, date unknown. I’ve typed it below along with a scanned copy. 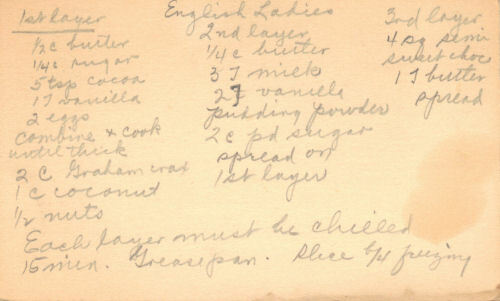 This is an old photocopy of a typed recipe that was found in a large collection, date unknown. I’ve typed it below along with a scanned copy. Mix above ingredients together, mixing thoroughly. Pour in greased 9×13 inch pan. Bake at 350° for 30 minutes. Let cool. 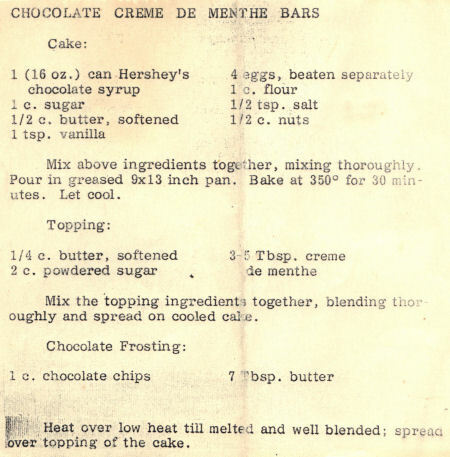 Mix the topping ingredients together, blending thoroughly and spread on cooled cake. Heat over low heat till melted and well blended; spread over topping of the cake.